Food matters. Especially when bringing new life into this world. During these significant stages of growth and development, special attention needs to be given to the types of foods—and the quality and quantity of nutrients they provide—for expecting mothers and their little ones. With a unique package of monounsaturated fat, fiber, folate and several other key vitamins and minerals, research shows that fresh avocados may play a beneficial role in the diets of both new moms and infants or toddlers1. A recently published review paper in Nutrients2, funded by the Hass Avocado Board (HAB), suggests there are certain characteristics to consider when choosing a first food that can help ensure optimal health and acceptance of nutrient-rich foods. These include nutrient density, proper texture and consistency, and a neutral flavor profile. Read more here. To learn more about the goodness of avocados for tiny tummies, check out our latest infographic and scientific summary. Fresh avocado is an easy ingredient to mix and mash with other nutritious fruits and vegetables, like this simple Avocado, Carrot and White Bean Mashup. 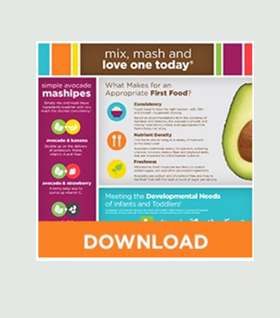 The good fats found in avocados can help enhance the absorption of fat-soluble nutrients, such as vitamins A, D, E and K. Find plenty of other mix- and mashable mom-and-kid-friendly recipes you can share with patients here. 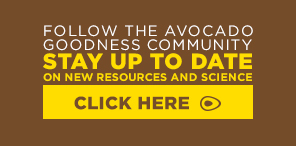 Discover more avocado-related resources and information for you and your clients here. © 2017 Hass Avocado Board. All rights reserved. 1. Before starting or introducing new foods, parents and caregivers should consult a physician or healthcare provider. 2. Nutrients 2016, 8(5), 313; doi:10.3390/nu8050313.